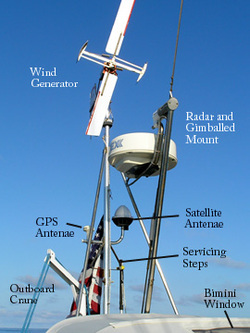 Mounted on the pushpit and visible high above the bimini sits the wind generator on a 12 ft pole. Due to the extreme and beneficial height, steps have been added to aid in servicing and removal of the device. The two GPS/Satellite antennae also utilize this pole however the radar dome has its own pole and gimbaled mount attached to the backstay. Some would say the pushpit is cluttered, however I prefer the word functional. When we are entertaining we utilize the back portion of our cockpit screen enclosure that zips to the bimini for a cleaner look. The Force 10 BBQ has a brand new element and its own aluminum propane tank attached to the pushpit. Note in windy conditions, we utilize tin foil to cover some holes to prevent the flame from blowing out. The fenders fit nicely between the cockpit combing and the pushpit and are in an always accessible location for those emergency rendezvous, plus they have the added benefit of being nice back rests. We have one more large fender but it is white and blue so even if there was space for it we would keep it in the lazarette due to the color clash. Hidden behind the fenders on the port side of the pushpit is the stern anchor in a ready to deploy state. See Ground Tackle for more details. Note the Mercury 15Hp outboard is mounted on the inside of the rail due to its size, we felt much safer with this solution. The crane was raised to facilitate the extra height needed to get it over the rail. Raising and lowering either outboard can be performed - with practice and when not too bouncy - by one person. The pushpit is also home to a plethora of man-over-board safety equipment (see below). The majority of the remaining safety equipment items live in the quarter berth on a special shelf. Behind everything slung off the back of Rosie sits Ian, our Flemming wind vane. Just visible below the Nissan 5Hp outboard are the two control lines that go to a drum on the steering wheel. Man overboard strobe. This is just hooked on to the life line. It is activated by a mercury switch that comes one once inverted, so just toss it after the lost soul and the light does the rest. PFD Type V life ring. This is attached to the lifelines via Velcro, just pull and throw. PFD Type IV life ring. This is a "Lifesling" over board rescue system complete with a rope and bag printed with instructions.